Handy tools for managing ever-growing Telegram groups. Run your communities, plan campaigns and track member activities using simple, flexible and easy to use tools. No headaches. No training required. Everything you need to manage your Telegram communities. Quickly see your group status at a glance with intuitive screens. Powerful bot automation service with intuitive configuration interfaces. Get a quick overview of all groups your are managing or participating in. Automatically reply members' messages with flexible trigger settings. Schedule your most important messages to automatically post. Clean up inappropriate messages or unwanted links from low-credit members based on various rules. Apply temporary message sending limitation on new members and encourage them for positive contribution to the community. Detecting offensive messages and restrict members from posting. One Button Start, Auto Admin Permission, Auto Admin Permission, and more. Your management tools are extremely easy to setup. Just one click to add the TeleMe bot to your group, and everything is set. TeleMe automatically synchronize with Telegram for group administration settings. Seamlessly integrated with your groups, requires zero configuration. Group administrators have full immunity when applying filters, auto responders and keywords removers on chat messages. 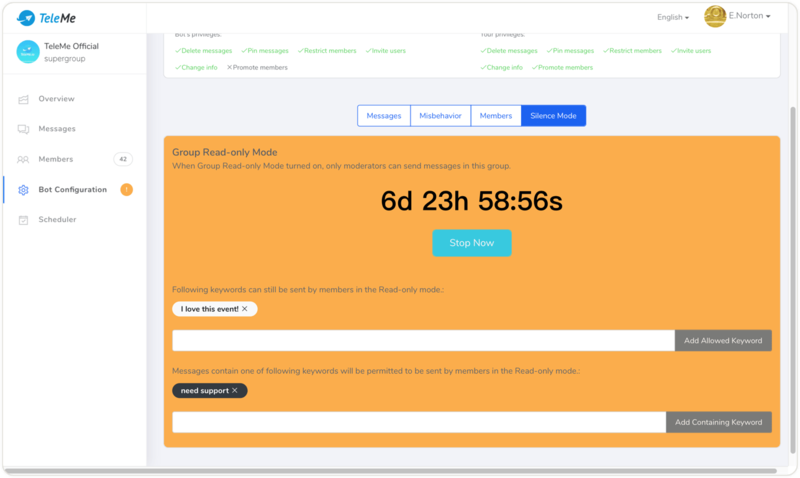 Instantly notify group administrators for giving prompt response when they are mentioned in members' messages. Instantly remove group messages of various type or keywords according to your configuration. While messages sent by administrators are exempted. Smart responder can be triggered by multiple keywords and different matching conditions. Significantly ease workload for building better community support. Automatically picking up a random greeting message from templates and sending it to newly joined group members. Support key fields in message templates. Apply difference temporary restrictions on newly joined group members. Each individual restriction can be further edited in member management. Clean up member join or member left messages from your group. Plan ahead and send messages in the future with flexible schedule settings. Use it with `Group Silent Mode` to turn your supergroup to a channel. Timezones are supported in schedule posting, report display and messages history. Intuitive reports paint a complete picture. Reporting helps you to track how your communities grow and see exact members' interaction. Reports give you lots of valuable information to help you improve your community growing forward. 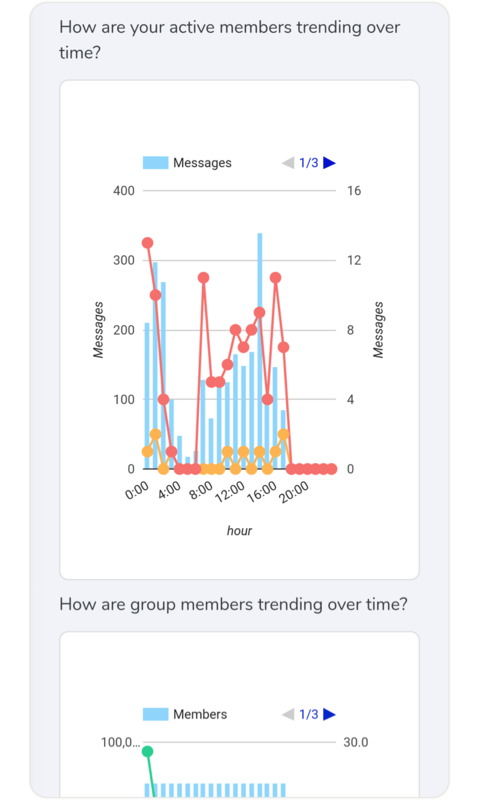 Interactive graphs show you how many members join, how many people talk in your group, what percentage active, and more. Find out what attracts people with TeleMe's group rank-lists. Learn from their habits, so you can better serve them. Through active users report you can determine the number of unique users who interacted in your groups. This could be a quick way to see user retention of your communities. Detailed activity reports for each individual group member. Visualize top members in your groups from all sorts of ranking lists. Historical trends allow you to track up to 36 months. It makes your life easier when you need to track changes day to day or week to week in your group. Real-time insights, Group History, Member History, and more. Access all your reports and data in real-time. Gain a competitive advantage by comprehensive information from minute-to-minute. View full message history up to 12 months of your group. View messages of individual chat members during specified period. View messages sent by chat administrators, as well as messages mentioned chat administrators. Daily reports are accumulated in monthly reports. Monthly reports will be store for up to 36 months. This feature does not require Excel to be installed and creates a fully functional Excel file from your selected report. Search through all members in your groups. View activities of each individual member and manage rights of them. Access a full list of group members joined after the adoption of TeleMe bot. Instant search gives you the ability to search for a group member based on the conditions you define. View each individual member activity report and edit restrictions for that member. Active Member Snapshots, Conditional Filters, Strict Synchronization, and more. Active member snapshots are available in certain time period(daily, weekly and monthly), which illustrates a clear picture of community growth in every moment. Conditional filters are available in advanced member search, give you the ability to quickly find member from large supergroups. Every individual member profile is strictly synchronized with Telegram, and so to provide you with most up-to-date information with no conflict with any other third party bot service. Keep tracking member’s credit for contribution or violation of community regulations. Restrict or remove restriction of multiple members in a batch. Stay on top of what's happening, work together, and keep your team focused on the community growth. TeleMe has been seamlessly integrated with Telegram Secure ID. The administrator team of your group is automatically recognized and synchronized, requires no extra setup. All management activates are logged. So you can easily see every effort made by your team. Administrative privilege of each team member on TeleMe is automatically synchronized with Telegram. Sophisticated protection to keep your community safe and clean. Messages from spammer using long name for advertising or phishing will be automatically cleaned. And spammers will also be restricted. 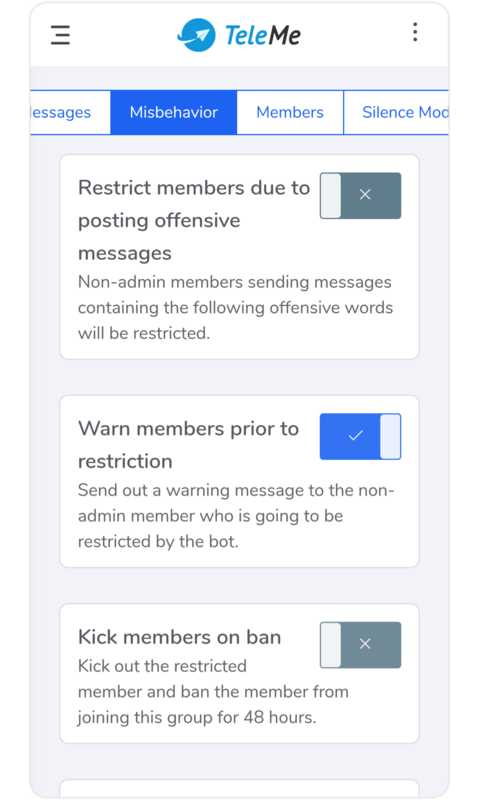 Bot commands flood is prohibited and senders will be restricted, without effects on ordinary usage of bot command. With member credit service across communities, most spammer can be automatically spotted for your judgement. When group silent mode switched on, only group administrators can speak in that group. This help you turning your Telegram supergroup to a channel temporarily. No matter if you're a small company or a large organization, our Customer Support teams have you covered. Our Support Team are here to help you and your team get up and running with TeleMe, and to answer questions or troubleshoot. If you have any questions, please do not hesitate to contact our support team by clicking the following link. Manage your Telegram community with TeleMe.